Teneo Linguistics Company, LLC, a full service foreign language services provider based in TX, shares tips companies and users can employ to maximize the benefit of an Over-the-Phone interpreting scenario. Over-the-Phone (OPI) interpreting has become an increasingly popular method of using an interpreter. There are many services out there who offer professional linguists available at the speed of need by phone, including Teneo Linguistics Company. This solution is typically less expensive than hiring an interpreter to come on location – charges are by the minute rather than by the hour. There are rarely any minimum fees and no travel charges come into play. 1. The meeting should take place in an enclosed room, preferably with a conference telephone (speakerphone) or with a special phone used just for OPI (dual handset phone). 2. All background noise that would make it harder for the interpreter to hear should be eliminated. If other persons are present, it helps to instruct them to be quiet. 3. After a connection with the interpreter is established, they should be informed whether a speakerphone will be used or not. 4. Everyone in the room should be introduced to the interpreter so he/she can write down their names since they will likely be used later in the conversation. 5. The interpreting will be conducted in the consecutive mode, meaning that the interpreter listens to the speaker and after that interprets what was said to the listener. Ideally, the increments of speech for interpretation should be no longer than about 2-3 sentences. 6. All speakers should use first person only – i.e. instead of “Interpreter, ask Mr. XY how he is doing today” the correct way would be “Mr. XY, how are you doing today?” If the client says “I don’t know,” that is exactly what the interpreter will say. 7. Only one person in the room speaks at any given time. 8. 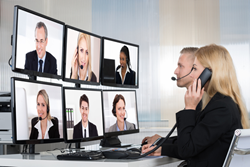 Unless video conferencing is used, the interpreter cannot see visual aids, paperwork, etc. If such tools are used, the speaker should describe them to the interpreter. 9. Any reading of written passages should be slow. When reading, people tend to speed up their speech, making it difficult for the interpreter to follow. The above tips apply regardless of the environment – a hospital setting, a business meeting, airport immigration or a school. Interpreters working through professional providers of OPI services are expected to adhere to the strictest standards of ethics and confidentiality, regardless on the purpose of the meeting they are called to interpret. If they receive assistance by the end users employing the above tips on the opposite end of the line, the end client’s experience with OPI should be a positive one.